Euro 2008 will see a range of digital developments. The first major tournament played in a Web 2.0 world - there are already some interesting things happening. The official UEFA Euro 2008 site has some interesting ways of engaging fans. From McDonalds sponsored fantasy football through to wide ranging RSS XML news feeds and even team specific widgets that can be included on blogs and in blog posts. Alongside official media coverage, Euro 2008 will be covered extensively through 'citizen journalism' and blogs. I was intrigued to see that even the President of the Swedish FA, Lars-Åke Lagrell, plans to blog throughout the tournament! Lagrell promises to write about everything from meetings with the UEFA President Michel Platini to activities with the Swedish team and I am sure he won't be the only official involved in blogging activities! The 'Together Everywhere' service, brings together supporters of the 16 national teams in real time. 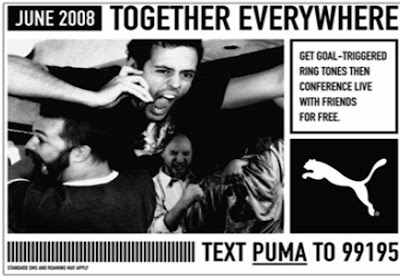 As soon as their favourite team scores, PUMA will call the supporters that have signed up for the service and instantly let them take part in a teleconference with friends, whether in the stadium, out in the street, a pub or in front of the TV! 'Together Everywhere' is the first mobile community marketing campaign carried out simultaneously in 13 countries and as well as the free teleconferencing it features a mobile site with exclusive free content, mobile goal alerts, registration by SMS and mcouponing. The campaign is supported by above the line / traditional advertising, mobile banner ads and a WAP push short code. In the UK the BBC and plan to show their Euro 2008 games live online through video streaming, whilst ITV.com will be showing highlights online as soon as the games have finished. All across Europe other broadcasters have similar plans and there are a number of other video websites that will also be showing the Euro 2008 matches live online. Whilst YouTube won't be able to show Euro2008 highlights, YouTube are running a Euro 2008 fan channel called '23 days - the YouTube Fan Diary'. They aim to have fans uploading videos of themselves at the tournament and will highlight the best contributions. England are not at Euro 2008, but across Europe there is significant interest and these digital developments will help bring it to life for fans.